085 Oswego Iron Smelter. [printed on back]: Oregon's first iron smelter. This historical chimney[sic] stands as a reminder of the industry which people once thought would make Oswego the "Pittsburgh of the West." You may get additional free copies of this card suitable to send your friends by phoning Goodall Oil Company at Ne. 6-1656. Description Color postcard from the 1950's. Same as 134b. Transcription 085 Oswego Iron Smelter. 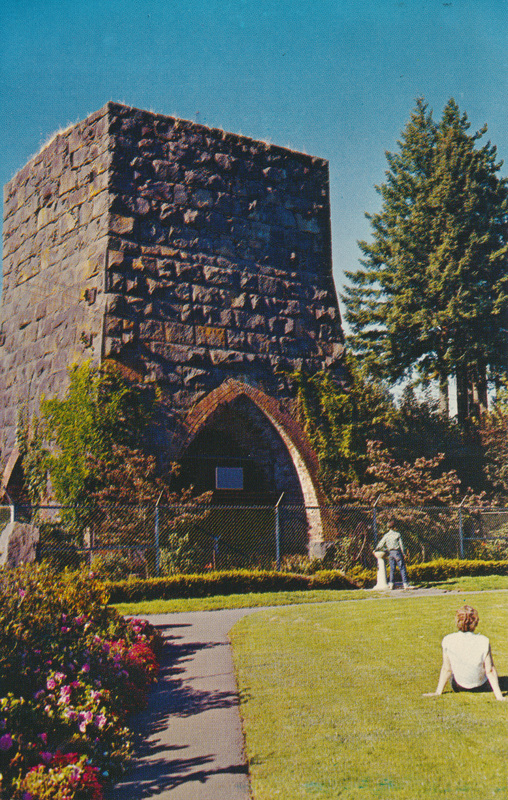 [printed on back]: Oregon's first iron smelter. This historical chimney[sic] stands as a reminder of the industry which people once thought would make Oswego the "Pittsburgh of the West." You may get additional free copies of this card suitable to send your friends by phoning Goodall Oil Company at Ne. 6-1656.